KIRIMI-CHAN! LET ME TAKE YOU WITH ME WHEREVER I GO! - EAT WITH HOP! Home / STYLE / KIRIMI-CHAN! LET ME TAKE YOU WITH ME WHEREVER I GO! I AM IN LOVE! THIS CROSS BODY BAG IS CUTE! THE LITTLE BODY AND BIG HEAD IS SO FUNNY! THIS MAKES A GREAT AND UNIQUE CROSS-BODY BAG! ALSO, DO Y'ALL LIKE MY GUDETAMA SHIRT?! HERE IS KEVIN AND I TAKING OUT OUR KIRIMI-CHAN TO PLAY! Here are some of the other variations of Kirimi-Chan! There are fishcakes, steam, and other fish! SO WHAT EXACTLY IS "KIRIMI-CHAN"? So the word "Kirimi" is actually a Japanese word to mean sliced.... things. 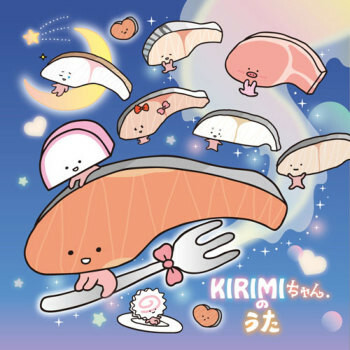 In this case, Sanrio (yes, the one that created Hello Kitty) created a bunch of new characters called "Kirimi-Chan" which are a group of sliced foods. I think they are going in the food direction (hence Gudetama) nowadays. While Gudetama is definitely a booming character right now, super popular worldwide, Gudetama was actually introduced around 2 years ago. So Gudetama is basically old news now. But I still love you Gudetama! Last summer (2015) when I was in Japan, I discovered Sanrio's newest character at the time: Kirimi-Chan! I thought it's big-headedness and small body was super funny! But so cute at the same time somehow. And since it's food related, I love it even more! Kevin and I traveled around Japan and found a bunch of Kirimi-chan themed snacks and candies. There was one gummy candy that was supposed to taste like Kirimi-chan (salmon version) and omg... it tasted horrible. We spit it out immediately. Still, it was pretty cute though. We planned to use it for a prank back home. Fast forward to my birthday, this year, Kevin surprised me with such a sweet gift! Not only did he surprised me for 2 months with a different gift each week, but all of his gifts were thoughtful. How does he know exactly what I like? One of those birthday gifts was this Kirimi-chan cross-body bag! I absolutely love it. And I love that he got himself a matching one so we can go around on our food adventures with our cute Kirimi-chan! Due to the nature of Kirimi-chan's head being so big, this bag actually is useful! By that, I mean it can fit a lot of stuff. I am able to fit my whole Nikon DSLR camera with room to spare! Maybe add some water bottles, wallet, sunblock and more! What a convenient bag! And doesn't it look so cute just hanging on our backs when we wear it? So now that you have been introduced to Kirimi-Chan, what do you think? Do you think this character will be as popular as Gudetama? I sure hope so, so there will be more Kirimi-chan products available in the U.S.!